Today we are lucky enough to have Amber with us Guest Blogging. Please take a moment to read her post and to leave comments in response in the comments below or on our Facebook Page. On June 1st 2013, my husband, Rajan and I found out we were expecting a baby. We were so excited to be expecting our first child. We hadn’t planned on getting pregnant but we knew God was blessing us with a very special gift. As our pregnancy went on we couldn’t wait to find out if our Baby T was a he or a she. We decided to get a gender scan at 15 weeks and we were ecstatic that our baby was a boy! Noah Jamar Treadwell would be born February 11th 2014, eight days before my 25th birthday. I couldn’t wait to be able to share our special days so close together. On September 7th, we spent the day shopping for Noah, eating out and just having a great day. During the day I had been having a pushing feeling down low but, I just thought it was Noah stretching out and pushing against me like I’d seen him do so many times in our ultrasounds. That night I woke up around midnight to make a trip to the bathroom. I noticed I was cramping really bad and when I got up I saw a gush of blood. I immediately woke up my husband up and we rushed to the hospital. In the emergency room they performed a pelvic exam and saw something alarming. I remember the doctor saying she saw something hanging out of my cervix, she thought it was a sac of some sort but she wasn’t exactly sure since this wasn’t her specialty. I felt completely confused, unsure and shocked. Noah still had a heartbeat so I had hope that whatever was happening our baby would be okay. Once they were finished with the exam I started bleeding profusely. I was afraid to get up because I thought it was “him” and I didn’t want to see what was going on, especially if I had just lost my son. I asked the nurse did I lose him and she simply responded no. They rushed me from the Emergency room over to the women’s center where I was placed in a labor and delivery room to be seen by a specialist. I didn't understand what was going on but, I knew Noah’s heart was still beating so everything would be ok. I was again reexamined and we received the worse news possible. My cervix somehow has opened and since I was only 18 weeks pregnant there was nothing they could do to stop my labor or to save our baby. I had to deliver my son Noah. He was born and died at 6:14am Sunday September 8th. He had no visual abnormalities anyone could see and they don't know why my cervix opened. I don’t know if we will ever get answers, but we were offered a genetic testing to see if that would medically find some answers. We kept our Noah with us for the next twelve hours. We couldn’t bring ourselves to give him back to the nurses and it's one of the hardest things we've ever had to do in our lives. I was so impressed by the nurses that took care of me and Dr. Napier who delivered our baby. The nurses held our hands and cried with us, they never pushed us to hurry up and give Noah to them for the last time, they supported us and went beyond their duties as a nurse. Dr. Napier came back after her shift ended and prayed with us, she didn’t care that she could get fired for what she was doing. Rajan and I needed her prayer more than she will ever know. The few days that have followed haven’t been easy, we have cried, cried and cried some more. I can't get the images of that day out of my head, it's like a movie replaying over and over again. I keep asking God to give him back to us or to send him to me in a dream. I just need one more moment with him and I know I will never get it. I need to know that our son knows how much his mommy and daddy loves and miss him. That we would have done anything to keep him here with us, I would have gave my life so that he could live his. I try to find comfort in the fact that I believe God needed him more than we did. I don't think anything could possibly prepare you for the loss of your child. During your pregnancy you day dream about what your life will be like, trips to the zoo, family pictures and playing outside with your little one. You imagine a new life, a new chapter and the high hopes you have for your child. Once I lost my baby I felt like my life had been sucked out with his, it's almost like when he passed he took my heart to heaven with his. The pain you feel is deeper than any pain you'd ever fathom. I only had my Noah for eighteen weeks, but it's like I’ve loved him my entire life. I’m a nursing student and I currently have an OB class. I haven’t been back to school, but I know I have to go back next week. I have to sit through that class and I’m expecting it will be torture while impeding on my healing process. I don't know if tomorrow, next year, next month or next week will bring us relief but, later today were going to church to find peace in the Lords plan. I think the healing process for us begins with talking so were going to try to find someone to talk to. I’ve found comfort in writing my story about Noah. Like I said earlier, I believe in God’s plan. We may not understand it now but one day I will and I think for Rajan and I the healing process starts with the one that created this plan. 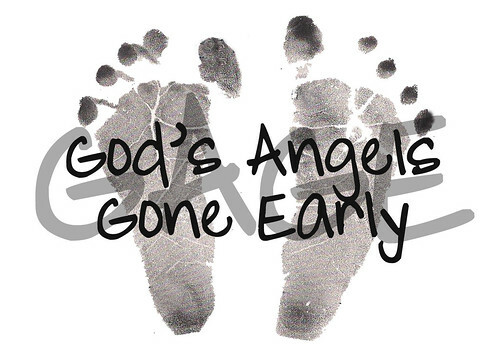 God allowed us to love our baby for eighteen weeks of his life and for as long as I have breath in my body I will never forget his beautiful face, his long feet, his long arms or the fact that he looked just like his daddy. But most importantly, I will never stop loving him.